Keep water flowing and free of ice by using the K&H Red Heated PVC Hose for your winter watering needs. This hardy water line allows you to clean your dog kennel, fill stock tanks, or top off your pond throughout the winter, thanks to its innovative heater. The double walled, PVC construction and solid brass couplings create a lasting hose, and its 40' length is great for a bevy of home watering needs. The 5/8", inner diameter couplings connect with standard outdoor spigots, while the included washers ensure a tight seal. 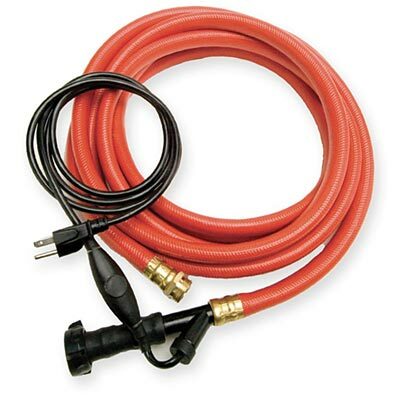 A heating element surrounds this robust hose, easily powered by a standard, 120 Volt outlet. The attached, 78" long cord allows you to safely place the hose a bit away from the outlet, and the enclosed element uses only 200 Watts to gently heat the water in the hose. The red color keeps the item visible, and the unit is thermostatically controlled to run only when necessary. Have flowing water available from your hose all year with this Red Heated PVC Hose. Two year limited warranty.